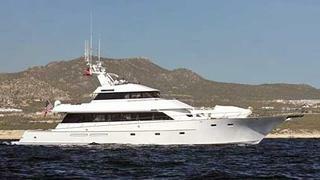 News in overnight from Jim Elliott and Todd Rittenhouse at Ardell that their central agency for sale, the 32.6m motor yacht Mr Terrible, has had a price reduction. Built by Westport in 1990, this superyacht had a major refit in 2003, including new paint, new generators and electronics and refurbished mechanical systems. Available to view at the forthcoming Newport Boat Show from April 15 to 18, her price has come down from $3.95 million to $3.5 million.